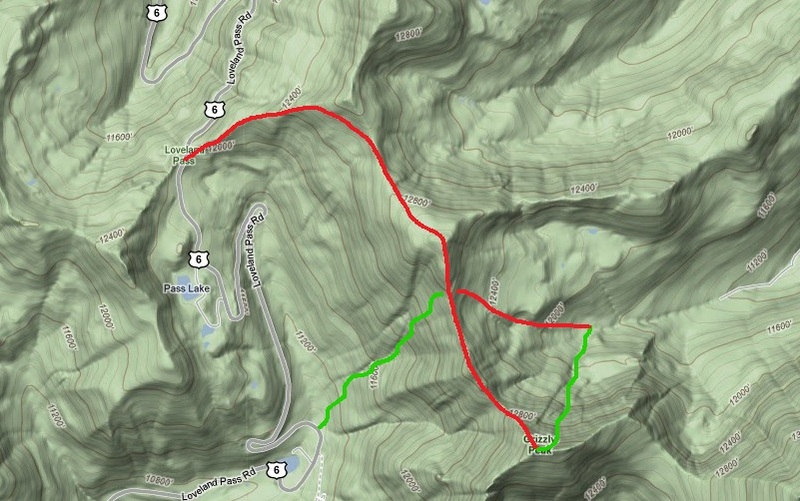 On May 13th 2009, Josh Nunnamaker, Jean Parks, and I set out to ski Grizzly Peak near Loveland Pass. Grizzly peak is one of the many high points on the long ridge that runs from Mt. Sniktau, to Torreys, to Grays, and then wraps around Stevens Gulch to Mount Edwards. Despite its close proximity to Loveland Pass and Grays and Torreys, its north face is not very visible, hiding several awesome lines located there. The north face proper holds several chutes and couliors that thread through the windswept face and its large cliff bands. I got the idea of skiing Grizzly when Ethan Vimont, Mike Mcmahon, Lindsay Records and I saw it from Sniktau a few days earlier. We began our day at the Loveland Pass summit parking lot and quickly gained the ridge line to the east, this is where we realized just how windy it was going to be all day. Fortunately I brought a face mask, so I was for the most part spared from the torment. We then followed the ridge line south towards Grizzly's northwest shoulder. This ridge line makes for some interesting travel because of its rolling nature. I opted for a combination of skiing, skating, and hiking which worked quite well. The ridge does have some very large overhanging cornices, so it is appropriate to stay far back from the edge on the way. As we passed Cupid and the top of Dave's Wave we got our first view of Grizzly's north face, and the Hourglass Couloir, located a couple hundred yards left(east) of the summit. By the time Jean and Josh arrived we were all ready to get out of the wind and start skiing. Finding the entrance was a little tricky as everything look pretty similar, and we knew there some large cliffs below us. Dropping in I expected the snow to soften up once we were out of the wind, but we never really got out of the wind. Despite the consistent winds, the snow was generally smooth, fun wind buff. The first couple dozen steep exposed turns were really fun as we were funneled into the Hourglass. The line stayed steep (mid 40s) through the constriction and opened up into a fast and open apron. After enjoying our line and the apron we found an enormous boulder that offered some protection from the wind, took a break to eat a snack, reviewed our line and checked out several future lines. In particular I'm really excited about a dogleg couloir located farther east along the ridge past the summit of Grizzly that offers a challenge entrance, exposed turns, and a tight choke. After finishing our lunch we prepared the skin back out of Grizzly Gulch towards our planned Loveland Pass reentry point at Dave's Wave. This is when we learned that Josh had opted against bringing skins or snowshoes along. I felt so bad for him having to bootpack back out through a foot of heavy spring concrete that I even volunteered to carry his skis for him. About half way out we passed under face below. For Loveland skiers it's basically the equivalent of Wild Child stacked on top of Super Bowl (ie 1500 vertical feet of fast open turns, with a big cornice and a couple LARGE cliffs). I would love nothing more to ski this on a stable spring pow day. When exiting Grizzly Gulch to Loveland Pass there are 2 saddles that you can take, it is important to take the northern saddle, which has a completely safe exit point free of a cornice, as opposed to the southern saddle which is guarded by a huge overhanging cornice. We reached the top of Dave's Wave rather late in the afternoon, but fortunately the roaring winds had kept the snow surface just firm enough to ski some great corn all the way down to upper Abasin parking lot. I would highly suggest this adventure to someone looking for a relatively easy day near Loveland pass. The Hourglass Couloir has awesome relatively steep and exposed skiing, and Dave's Wave provides an easy exit with another 2000 vert of turns. Because Dave's Wave faces west it also gets soft a bit later, just in time for some early afternoon corn turns. However, because of the amount of time spent on already windy ridge lines, I would recomend against doing this on a windy day. Plus, I am always a fan of a good car assist: parking at the top of Loveland Pass and hitchhiking back up at the end of the day gains you an extra 1000 vertical feet of skiing.